There has been a lot of focus over the past year on the virtualization of the future network, and rightly so, as it involves a major technology shift that brings both SDN and virtualized functionality into the service delivery process. However, less has been shared on how operations environments within service providers will adapt to this new network. 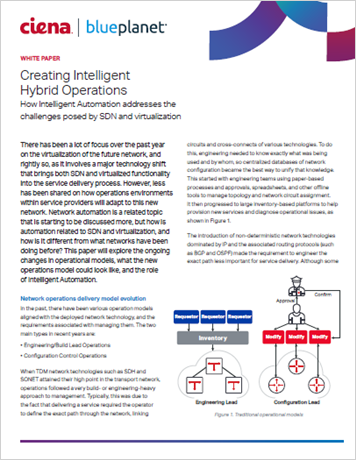 Network automation is a related topic that is starting to be discussed more, but how is automation related to SDN and virtualization, and how is it different from what networks have been doing before? This paper will explore the ongoing changes in operational models, what the new operations model could look like, and the role of Intelligent Automation.